Spentzofai (pr. Spehn-tzoh-FAH-ee) or sometimes written spetzofai, without the “n”, is a Greek traditional recipe from Pelion, Thessaly. The traditional recipe is made with local sausages and lots of peppers, especially a hot variety called spentzes, from which the dish takes its name. The sausages and peppers are cooked in a sauce by adding onions, tomatoes, wine and just salt and pepper because most of the taste of this dish comes from the spices in the sausages. After making Spetzofai many times, I have made my own twists to the traditional recipe, so today you will find two different recipes, one made almost the traditional way and the second using my homemade spicy sauce, which made the procedure much easier. In the second recipe I did not have any hot peppers. so I added bell peppers and to give it a kick, I added a pinch of harissa. Feta is added, optionally. Note: More recipes added at the end of the post. Last Thursday was Tsiknopempti, which literally translates as stinky (or smelly) Thursday. Stinky in a good sense, referring to the smell (tsikna) of the smoke coming , from the charred meat, which fills the atmosphere from everywhere on that day, as it is a tradition to grill or fry meet. Pempti means fifth as it is the fifth day of the week. Furthermore, Tsiknopempti is during the carnival period so it’s one more reason for people to celebrate before the 48 days of fasting during Lent. On this day the municipalities organize outdoor barbecues and grills in central squares while the municipal bands play happy carnival music and people have fun. At least this was the situation until the economic crisis hit us! This year the situation is tragic in Greece. The same arrangements were made this year as well. Varvakeios, the central market of Athens, in collaboration with the meat vendors and the municipality of Athens, organized outdoor grills by offering almost 1.5 tons of meat (chicken, sausages, pork, lamb etc) as well as 200 kilos of wine and the band was there trying to cheer up people. However, all you could see were endless queues of people of all ages waiting patiently with grimmed faces to fill their tummies. Not only pensioners, who’ve seen their already scant pensions reduced to 300 – 400 Euros a month but also younger unemployed people, who are desperate to find a job and families who cannot cope with one reduced salary and meat is now a luxury for their survival. You may see pictures here. This is Greek reality today. The majority of the Greek people, have been affected by the economic crisis, one way or the other. We are still among the fortunate who still have food to eat but don’t let this mislead you because we are also making lots of other sacrifices to cope with less money and increased bills to pay. We did not go out as is the tradition but I prepared a few things for a family gathering at home. I prepared Spetzofai as well as some Pizzas. In my recipe I used some spicy sausages and my Homemade Spicy Tomato Sauce, which I also used both in Spetzofai as well as in the pizza. Having made the sauce several days earlier, made the procedure much easier for both recipes. Fully open one bun per person and place some sauce on both sides. Add some slices of tomato, on which sprinkle some oregano. Then, put a few slices of lountza or other smoked pork and a few slices on halloumi on top. Finally, top it with shredded mozzarella. Repeat exactly the same with the remaining buns. Preheat oven to 180o C and bake until mozzarella melts, about 10 minutes. Sandwich both pieces and enjoy! The first recipe included spicy sausages, three kinds of peppers (bell peppers, pickled hot peppers and roasted Piperies Florinis), bacon and eggplants. Cut each eggplant into four slices and brush each with about a teaspoon of olive oil. Bake in a preheated oven to 180oC / 350oF, for about half an hour or until the eggplants are soft. Meantime cut the sausage into slices about 2 cm each and bacon into larger pieces. Peel onions and garlic and finely chop them. Remove seeds from the peppers and julienne them. Blend tomatoes together with tomato paste. Cut the roasted eggplants into smaller pieces. In a skillet heat a tbsp olive oil and sauté the sausages and bacon on both sides. Remove to a platter and heat the remaining oil. Add the onion and sauté about 5 minutes and then add garlic and sauté 2 – 3 minutes until translucent. Add the peppers and stir until all ingredients are well mixed. Add the bacon and sausages as well as wine and mix for 2 – 3 minutes until the alcohol evaporates. Finally add the tomatoes, salt and pepper, mix and cover. Cook for about 20 minutes, stirring occasionally until the sauce thickens. Serve warm with rice, pasta or fried potatoes. Note: Leftover can be eaten the next day cold, as a mezes, or it makes a delicious pizza. The only ingredient you need to add is some cheese on top. Τhe second recipe is much easier as I used my spicy sauce and except for sausages and peppers, I have also added some mushrooms and feta. You will find this recipe at the end. Saute some mushrooms which add at the end. Cook fussili al dente and mix in the leftover spetzofai and you will have the most amazing pasta dish. I have also made this dish with ditali pasta. Spentzofai served with local pasta from Argolida, called Gogges. Turn your leftover Spetzofai into a risotto. Add your lefttover spentzofai sauce on a Kebab served on Greek pita bread, served with Greek yoghurt. Leftover Spentzofai makes a wonderful pizza. Just add some cheese on top! Spetzofai (pr. Speh-tzoh-FAH-ee) or sometimes written spentzofai is a Greek traditional recipe from Pelion, Thessaly. 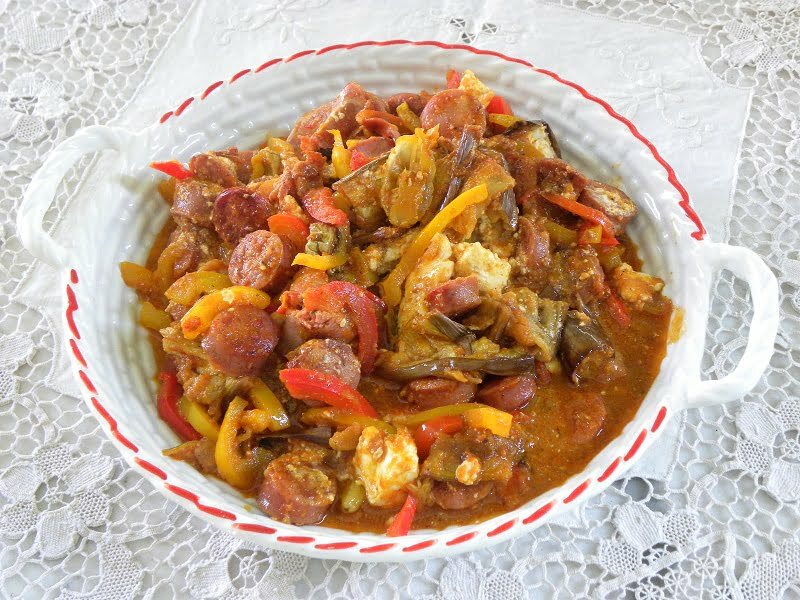 The traditional recipe is made with local sausages and lots of peppers, especially a hot variety called spentzes, from which the dish takes its name. In a heavy skillet add 1 tbsp olive oil and sauté the mushrooms on both sides. Remove to a plate and set aside. Heat another tablespoon olive oil and sauté the sausages and bacon on both sides. Put the sausages in a plate and wipe away any fat from the skillet. Add the remaining olive oil and sauté the bell peppers for a few minutes. Add the sausages and the mushrooms back in the skillet and add the wine. Cook for a few minutes for the alcohol to evaporate..
Add the spicy sauce, feta, salt and pepper, harissa and mix. Cover with the lid and cook for five minutes. Serve hot with lots of crusty bread. Oh, what a scrumptious dish! So satisfying. Yummy dish! On Tsiknopempti all we had was meat cooked on charcoal and a lot of zivania :-)!! My mum is looking forward to your new cookbook. Keep working on that, I am sure it will be a huge success. I really love spetsofai! Yours looks just delicious! Amazing selection of ideas here Ivy. I love how you styled the paputsakia…LOL! Very clever! LOVE spetzofai and I need to make it soon. Also, your papoutsakia are the cutest I have ever seen! I am loving this dish. It looks so very delicious. I love dishes that meat and veggies are combined. This sure looks very tasty and perfect with some steamed rice! The situation in Greece is very unfortunate, but it’s good to see that in difficult times communities come together to help each other. The best way to pull through situations like this is with good food and you guys know how to do that! Hugs my friend. Things always get better. I really like the pizza sandwiches recipe, simple but effective. I had just bought some buns today to prepare hot dogs tomorrow but now I think I will use them to make your pizza sandwiches. I really love oregano on most dishes involving cheese. Both look equally delicious Ivy! I like that you gave us an easier version. I am so sorry about your economic crisis – I did not realize things were so bad. I really feel for the Greek people who are going through such a tough time. I have had a special love for Greek food since my grade school days when we had a feast of traditional Greek food to go along with our ancient Greece reports. I am sure this will make for a great dinner with my family. Je suis sincèrement désolée de tout ce qui arrive à la Grèce. La situation doit être désespérante et ce n’est malheureusement toujours pas fini. Espérons que bientôt on vivra tous un léger mieux pour déguster ces merveilleux plats avec plus de joie au coeur. I don’t recall having Spetzofai when in Greece, and I know I would love it since I love spicy food. Love the variety of dishes that you have here. Yes, we have been following the situation in Greece and it is really terrible. Thinking of you during such tough times just now, Ivy. All I can say is bring on these spices and vive la cuisine from Greece. We love you! My oldest loves spicy foods and will go crazy for this 🙂 Beautiful dish and recipe Ivy! Wonderful flavors!I love spicy food….love this dish,Ivy! Thanks for the recipe. I will be cooking for my family tonight..